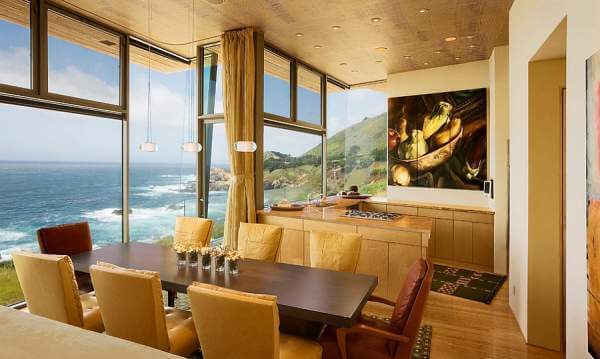 Have a look at some definitely breathtaking dining rooms that will bring back your memories of the beautiful, lazy summer time. Contemporary dining rooms are often a part of an open-floor living plan, with the kitchen and living area flanking them on either side. Some people opt for an extravagant dining space, others prefer a small one that is cozy and elegant. 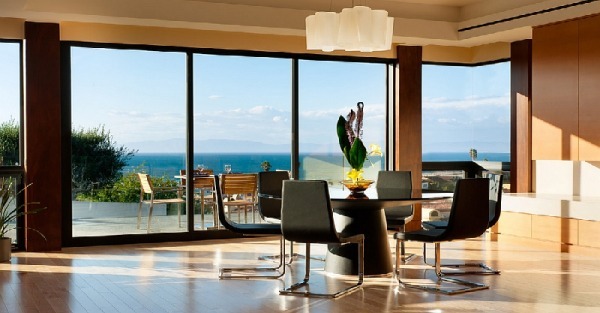 Regardless of your choice, just imagine you are among those lucky people who have a dining room with an ocean view! 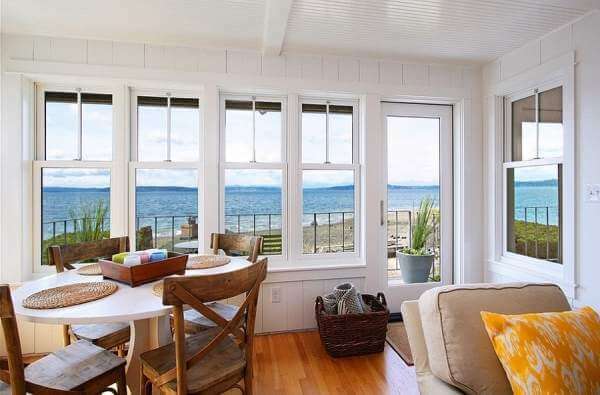 Much like any other space with a view of the distant waves, the ocean becomes the showstopper of this setting. 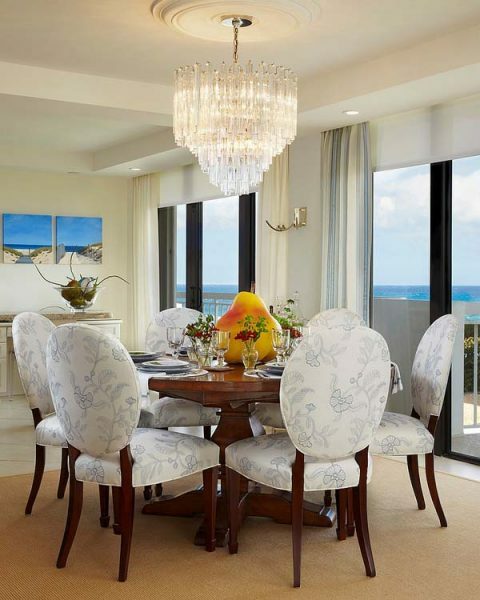 Furthermore, such dining rooms bring the charm of sun, sand and surf indoors. 1. Glassy all the Way! Furthermore, this will visually expand the space and provide natural ventilation for a refreshing ambience. 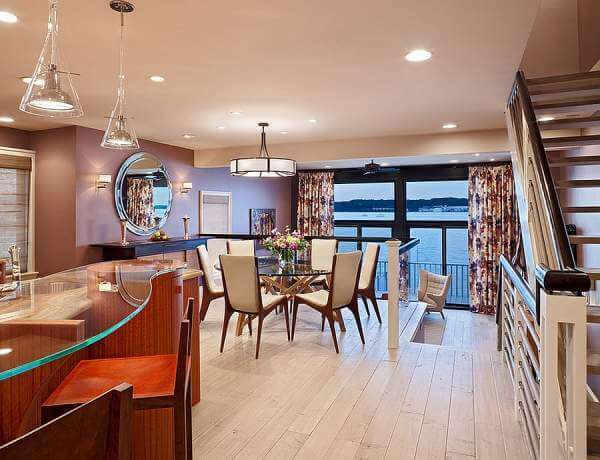 Opt for understated, elegant decor and try not to use large lighting fixtures because they will block the view. When it comes to interiors with an ocean backdrop, a blue-and-white color scheme is the natural choice. Add vibrant accents – tropical flowers, wall art, jewel-toned throw pillows and vases, that beautifully complement the blue-green of the sea to create a rich contrast of colors in your interior for a truly breathtaking look. With such a view, you have multiple design options. You can add some potted greenery, dark wooden accents and accessories in a soft sandy palette to lend your dining room an earthy tropical look with a modern feel. In addition, this solution will make sure that it offers the best possible view. You have plenty of options to choose from. No matter what theme you pick, as the ocean is the true focal point of your dining room, it undeniably will be a charming, awesome space.